NU AQR (Nu Aquarii). Some stars are made well-known by the cultures that found them important, others by their physical natures, still others by position. Here we have a little bit of the first, not much of the second, and a whopping lot of the third. Nu, Mu, and Epsilon Aquarii in southwestern Aquarius north of Capricornus are part of an Arabic trio called Albali, "The Swallower" (of unknown origin). The name eventually was applied to Epsilon alone, leaving Mu and Nu with their Greek letters. As a just-barely-fifth magnitude (4.51) class G (G8) giant star, Nu Aquarii is pretty normal. A well-determined temperature of 4980 Kelvin (to account for infrared radiation) and a distance of 164 light years leads to a luminosity 42 times that of the Sun and a modest radius (for a giant) of 8.7 solar. A slow projected equatorial rotation speed of 2.8 kilometers per second then leads to a rotation period of under 155 days, which is not very restrictive. Application of theory yields a mass of 2.0 times that of the Sun, and shows it to be a 1.25 billion-year-old helium- fusing "clump star," so-called because it is one of many of its kind. And it seems to be all alone, with no evidence of any companion. It's Nu Aquarii's location that got the star into the history books, as it was given as a guide by William Herschel (the discoverer of Uranus) to the first of the "planetary nebulae," an object we now know as the Saturn Nebula, or simply NGC (for New General Catalogue) 7009. (The Ring Nebula in Lyra was already known, but was not put into that category until later.) Planetary nebulae, having nothing to do with planets, are expanding gas shells surrounding very hot stars. The shells are the ejected envelopes of advanced giant stars like Mira, and the resulting central stars are the ex-nuclear-fusing cores that once powered them and that are now turning into white dwarfs. Hear Herschel's own words in the Philosophical Transactions of 1785, from an article entitled "On the Construction of the Heavens:"
"I shall conclude this paper with an account of a few heavenly bodies, that from their singular appearance leave me almost in doubt of where to class them. The first precedes Nu Aquarii 5'.4 minutes in time (5.4 minutes, 1.25 degrees), and is I' (minute of arc) more north ... The planetary appearance of the first two is so remarkable, that we can hardly suppose them to be nebulae; their light is so uniform, as well as vivid, the diameters so small and well defined, as to make it almost improbable that they should belong to that species of bodies." 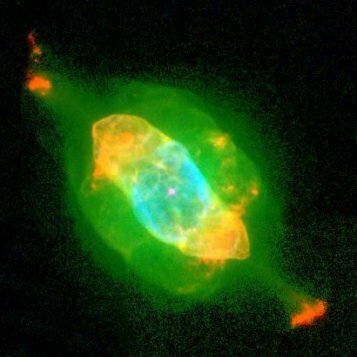 NGC 7009 displays a pair of jug-handle-like "ansae" that give it the name "The Saturn Nebula." 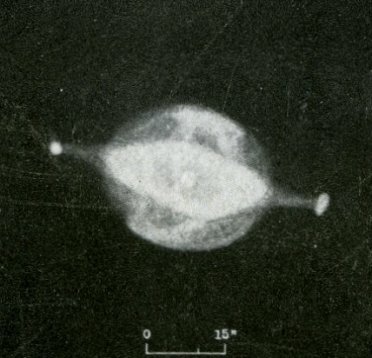 On the left is a drawing made early in the twentieth century from a series of primitive photographs, the gaseous nebula perhaps appearing as its discoverer William Herschel may have seen it. On the right is a Hubble Space Telescope image made 80 years later, showing the vast improvement in astronomical imagery as well as the immense complexity of the nebula. The hot (90,000 Kelvin), blue, 13th magnitude star at the center is the old nuclear-burning core of what was once an extended giant star, while the surrounding nebula is the inner part of the star's lost envelope that has been structured by the remaining star's hot wind. The distance is not known. If at 2000 light years, the nebula is 3/4 of a light year long. The 13th magnitude central star seems faint only because of its distance and because the vast majority of its radiation comes out as energetic ultraviolet light. In reality, the star is thousands of times more luminous than the Sun. It will eventually fade to become one of the many white dwarfs that dot the cosmos. Left: Studies of the Nebulae, Lick Observatory Publications, vol XIII, 1918. Right: B. Balick, J. Alexander (U. Wash.), A. Hajian (USNO), Y. Terzian (Cornell U. ), M. Perinotto (U. Florence), P. Patriarchy (Arcetry Obs. ), and NASA. Thus was born the oft-confusing term, by which Herschel merely meant "disk-like." After all, who had a better right than the discoverer of the first planet since ancient times? After tens of thousands of years, the cloud surrounding the blue central star will dissipate, leaving behind the hot, cooling white dwarf -- a ball of carbon and oxygen about the size of Earth. Find it by setting a telescope on Nu Aquarii. Shift it to the west a bit over one degreem and lo, the Saturn Nebula moves into view, and you might experience the mystery that Herschel himself must have felt. Written by Jim Kaler 11/14/08. Return to STARS.